Dornálaí Gael-Mheiriceánach, a bhí ina churadh domhanda trom-mheáchain, ab ea James J. Braddock (7 Meitheamh, 1905 – 29 Samhain, 1974). Bhaist a thuismitheoirí James Walter air ach d’athraigh sé a ainm go James J. in ómós don bheirt iar-churadh domhanda James J. Corbett agus James J. Jeffries. Chaill sé mórán airgid i rith an Spealta Mhóir i 1929. Ar an chúis sin, agus siocair go raibh sé i ndiaidh a dheasóg a bhriseadh an bhliain roimhe sin, b’éigean dó obair a lorg mar dhugaire neamhoilte chun a bhean agus a thriúr clainne a chothú. 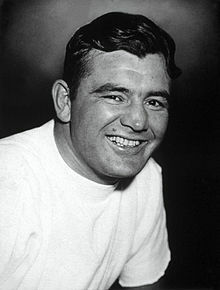 Cionn is gur tháinig sé aniar ó na tubaistí seo chun craobh an domhain a bhaint thug Damon Runyon The Cinderella Man air. In Hell’s Kitchen, i gCathair Nua-Eabhrac, a rugadh James Braddock, cúpla céad slat siar ó Madison Square Garden, príomhionad dornálaíochta an domhain, agus áit a mbainfeadh sé féin cuid mhór babhtaí ní ba mhoille ina shaol. Bhí a mhuintir beo bocht, agus mar sin ní bhfuair sé mórán de shó an tsaoil, ná mórán oideachais fiú. Dálta a chuid cairde uilig ba é mian a chroí peil Mheiriceánach a imirt le Fighting Irish (Ollscoil Notre Dame), ach murab ionann agus mórán dá chairde, bhí an mianach spóirt go smior ann. Tháinig an bhochtaineacht salach ar a chuid pleananna, áfach, agus b’éigean dó dul amach ag obair agus é fós an-óg. Ní raibh an daibhreas mar bhac ar an dornálaíocht. Mar amaitéarach bhí sé ina churadh trom-mheáchain agus scothmheáchain ar New Jersey ag an am céanna. Sa rannóg scothmheáchain a chuaigh sé leis an dornálaíocht ghairmiúil nuair a bhí sé bliain agus fiche d’aois. Taobh istigh de thréimhse trí bliana throid sé sé bhabhta agus daichead. Chríochnaigh seacht gcinn acu ar comhscór, chaill sé cúig cinn, agus bhuaigh sé an chuid eile, ceann is fiche acu sin le buillí scoir. I 1928 fuair sé tairiscint troid in éadan Tommy Loughran, fear a bhí ina iomaitheoir craoibhe aitheanta. I rith an bhabhta sin bhris sé roinnt de na cnámha ina lámh dheas agus chaill sé an troid le breith mhóraimh. Mar bharr ar an donas, nuair a fuair an Coimisiún Dornálaíochta amach go raibh sé ag iarraidh troid le dorn briste, chealaigh siad a cheadúnas dornálaíochta. Nuair nach raibh sé in ann troid ná oibriú thit sé i lionn dubh, agus ar feadh roinnt míonna bhí sé cráite ar fad ag an dúlagar. Faoi dheireadh chuaigh sé ag lorg deirce ó eagraíocht fóirithinte rialtais. Ghoill sé seo go mór air, agus thug sé an t-airgead ar ais a luaithe agus a bhí sé d’acmhainn aige. Agus é ag dul d’obair láimhe ar na dugaí b’éigean dó bheith i muinín a chiotóige, rud a d’fhág a chiotóg chomh láidir lena dheasóg agus a chuidigh go mór leis sa dornálaíocht ina dhiaidh sin. Bhí sé cairdiúil i gcónaí lena bhainisteoir, Joe Gould. Chuireadh Gould an-bhrú air agus bá ghnách leis dul ag traenáil go rialta. I Meitheamh na bliana 1934 tharla gur fágadh an dornálaí cáiliúil John “Corn” Griffin gan céile iomaíochta dhá lá roimh an bhabhta. Nuair a dúirt Joe Gould le bainisteoir Griffin go raibh Braddock sásta a bheith mar shop in áit na scuaibe, glacadh leis an tairiscint le fonn, nó ní raibh dornálaí ar bith eile ar fáil. Ag cruinniú éigeandála den Choimisiún Dornálaíochta rinneadh athnuachan ar cheadúnas James J. Braddock, agus cé nach raibh sé i ndiaidh troid le cúig bliana, leag sé Griffin le buille scoir. I mí Lúnasa throid sé in éadan John Henry Lewis, fear a bheadh ina dhiaidh sin ina churadh domhanda scothmheáchain. Nuair a bhuail sé Lewis, agus Art Lasky seacht mí ina dhiaidh sin, fuair sé an seans a raibh sé féin agus Joe Gould ag fanacht leis: troid in éadan an churaidh dhomhanda, Max Baer. Bhí foireann bhainistíochta Baer den bharúil láidir gur mó an t-ádh ná an ealaín a bhí ag baint le Braddock, agus nach mbeadh stró ar bith ar Baer an gus a bhaint as. Bhí Baer mar rogha na coitiantachta, agus bhí na geallghlacadóirí ag tairiscint 1 in aghaidh 10 go mbuailfeadh sé Braddock. Ar 13 Meitheamh, 1935, in Madison Square Garden Bowl, bhain James J. Braddock craobh-bhabhta trom-mheáchain an domhain le cinneadh d’aon ghuth ó na breithiúna. Bhí sé tríocha bliain d’aois, ceithre bliana ní ba shine ná Baer agus ní ba lú ná é go mór. An oíche sin d’admhaigh an t-iarchuradh go bhfuair sé an bascadh ba mheasa dá bhfuair sé riamh agus go raibh sé i ndiaidh Braddock a mheas go mór faoina chumas. I mí an Mheithimh 1937 throid sé in éadan Joe Louis i bPáirc Comiskey, os comhair caoga míle duine. Leag sé Louis i ndiaidh dhá nóiméad, ach tháinig an fear óg chuige féin go gasta, ghlac sé ceannas ar an bhabhta agus taobh istigh de leathuair an chloig bhí curadh domhanda nua ann. I ndiaidh an bhabhta fuarthas amach go bhfuair Braddock instealladh don airtríteas díreach roimh ré, rud a d’fhág mairbhe agus laige ina sciathán clé. Ina ainneoin sin throid sé go fíochmhar. Roinnt blianta ina dhiaidh sin, nuair a cuireadh ceist ar Louis cérbh é an dornálaí ba chróga ar throid sé ina éadan riamh, d’ainmnigh sé Braddock. Sheas sé sa chró dornálaíochta gairmiúil den uair dheireanach i 1938 nuair a throid sé in éadan Tommy Farr ón Bhreatain Bheag. Bhí Farr chun tosaigh go luath sa bhabhta, ach tháinig Braddock aniar agus leag sé Farr trí huaire sular bhain sé an troid le cinneadh d’aon ghuth. I 1942 liostáil sé féin agus Joe Gould in Arm Stáit Aontaithe Mheiriceá agus thraenáil siad saighdiúirí sa chomhrac aonair. Fuair James J. Braddock bás i 1974 agus é in aois a naoi mbliana agus trí scór. Tugadh an leathanach seo cothrom le dáta an 10 Aibreán 2019 ag 19:14.